Each jewelry item represents a certain information symbol. Drawn from everyday life, as well as from epos and myths, apothropaic emblems found in jewelry had a magic power. The popularity of every particular subject was associated with concepts of the epoch. The jeweller was involved in the events of his epoch; ideas and concepts of the time were not foreign for him and were frequently reflected in his art. When used as amulets, jewels had two main functions- those of protection and “propagation”, the latter implying fertility. The images created by the ancients were thought to have magic power. Applying an image to an ornament or to a piece of clothing meant, “to animate them with spirit " It was a peculiar way to "sanctify" objects and associate them with the mystic powers of the other world. According to us, all art symbols are grouped around several binary oppositions (9). The binary opposition system underlay the art of the ancients and corresponded to the constructive principle of dualistic mythologies. Thus, the opposition between left and right was connected with differentiation of colors: the left symbolized femininity, and the right masculinity. The color of the former was red and the latter –white. The sun symbolized femininity and the moon symbolized masculinity .The unifotmity of religious outlook associated with the heavenly bodies gave an outlet to the similarity of material embodiment of these beliefs, irrespective of ethnic differences(5). Let us consider the images most frequently found among the archaeological remains of Central Asia, the emphasis being on the jewelry discovered in Bactria.These are golden and silver ornaments from the treasures of the Oxus (6), Tillya-tepe (3) and Dalverzin-tepe(7); they cluster around two deities: the Moon and the Sun. A cross as an emblem of the Sun, which is a symbol of Resurrection and Immortality, is portrayed on the diadem discovered in the third tomb of Tillya-tepe. Like the circle and square, the cross-divided the inner and outer space emphasizing the concept of centrality. It provided the geometric representation of the World Tree symbolizing Death (21).Sometimes the cross was employed to represent lunar and solar radiation. Everything associated with God, heavens and non-existence was defined by odd numbers. In Central Asia, number seven was considered to be the most sacred number. Along with number three, the “magic seven” was the most popular number in different mythological systems. Its overwhelming magic power was attributed to its interconnection with the Moon phases and cycles (20). Special meaning and symbolism, holiness and perfection were attributed to it. Its indivisibility linked it, ipso facto, to God (1) and indicated the days of the week, Ursa Major the seven spheres, and seven colors. The numbers 3, 4,5,10,12,40,70 and 100 were sacred as well to many ancient peoples. Odd numbers were related to happiness and well-being, and symbolized perfection. Number three is the most significant one in all mythological systems. It is an ideal model of any dynamic process implying creation, evolution and decay. This model is manifest in the vertical structure of the Universe (19) All the above symbols can be found in the ornaments of the period under study, both in shape and small details. Zoomorphic images found in jewelry also had a symbolic meaning. Thus, the lion was the symbol of supreme heavenly power and greatness, of the Sun and the Fire. It was associated with intelligence, generosity, courage, fairness, pride, triumph, arrogance, bravery and vigilance. The lion, as a symbol, was often depicted on the coins of the ancient Graeco-Bactrian and Shaka kings, but it disappeared in the Kushan period (17). The lion also symbolized the destructive power of the female deity. In ancient Indo-European texts and folklore, wild animals were considered to be sacred (2). 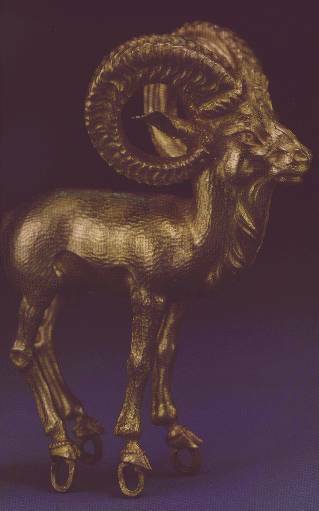 In Central Asia, the mountain goat and the ram were believed to be sacred bearers of solar energy. The Goat was worshipped as a symbol of fertility. 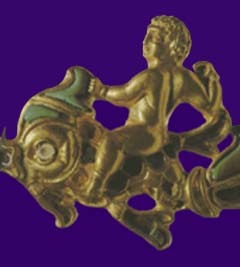 Its horns were represented on ornaments. The image of the ram, as an embodiment of Pharn (good spirit, household protector), became popular particularly in later periods, e.g. in Sassanian art. Fertility was also associated with the image of snake. An earring from Dalverzin-tepe shaped, as a snake is one of the multiple examples of this image widely used in jewelry. Almost all mythologies connect the snake to the earth female fertility power, the water and the rain. The use of a snake’s head in jewelry emphasizes the concept of the snake as a defender. Stylized snake motifs are frequently found in bracelets. These were obviously designed to protect against the evil spirits and evil eye. Snakes were believed to protect the souls of the dead from the evil spirit. The Tajiks inhabiting mountain regions believed in the existence of the great wizard Shokhi Moro (The King of Snakes) who dwelt on a mountain peak and ruled over all the snakes and dragons. The snake motifs were used in the ornaments of the Pamir settlements -in those of Darvaz, Vanch, Yazgulem, Rushan and Shugnan, which proofs that the same mythological symbols circulated in different areas (12). The Greeks worshipped the snake Erichthonios, son of the Goddess of the Earth, and snakes were kept in great number in the temple of Athena as a tribute to the Goddess of Wisdom. In India, Vishnu, one of the gods of the triad, was depicted lying on the great snake Sesha (18). The lunar snake, much like horns and thorns, was among the most widely spread symbols of the Moon religion. The snake and the fish were interchangeable symbols. 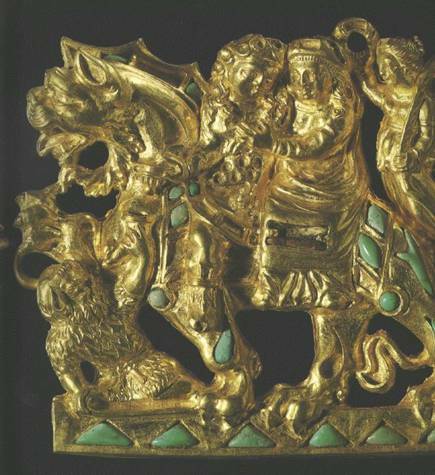 Among the imaginary animals represented in jewelry, the most popular one is the gryphon (animal-shaped bracelets nos.116 and 116a from the treasure of Oxus) (6). In Central Asia, the gryphon first appeared in the 5th-4th centuries B.C. Its original iconography was formed in the early states of the Front-Asian world. In Greek mythology, the gryphon is a monstrous bird with the beak of an eagle and the body of a lion. Among the anthropomorphic images are those of the gods. In the period from 4th century B.C. to the 2nd century AD the pantheon in Bactria expanded from Hermes and Zeus to the Dioskoroi, Heracles, Apollo, Athena, Artemis, Nike, Dionysus, Poseidon, Tyche, Demeter,Aphrodites. To these gods Kybele from the Middle East and Nana were added. The appearance of Cupids, Aphrodite’s’ sons and companions is only natural. In terms of cosmogony, Orphics treated Cupid, i.e. Eros, as an embodiment of the law ruling Universe. In Chaos, he symbolized the creator of cosmos and the original power of conception, which was one of the elements of the world creation. Eros, like other demoniac creatures, was given wings to emphasize his demonic nature. Till the Hellenistic epoch, painters and sculptors constantly portrayed Eros with huge wings. 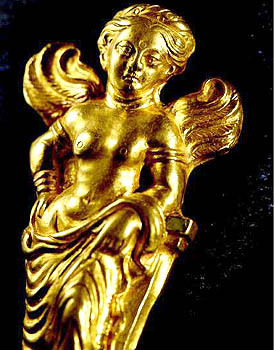 Due to the fact that Greek and Hellenistic works of art were widely exported to the oriental countries as far as India, in the East the iconography of Eros became well known in the early historical period. The representation of Cupids and Aphrodite in female jewelry emphasized sensuality. Among floral decorations, the lotus is one of the most frequently represented images (13). Lotus embodies creative power of the female nature and symbolized fertility, posterity, longevity, health and vitality. In later periods in apparently transforms into a tulip, often found in the embroidery of Central Asia. A tree with birds on its branches symbolized fertility, happiness and prosperity. One of the Avesta hymns glorifies the sacred tree possessing the seeds of all the plants existing on the Earth. Some of the birds are plucking the branches; others are picking up the fallen seeds and carrying them to the sky, from where they return to the Earth with the rain to give birth to new plants. In the period going from 5th century B.C. 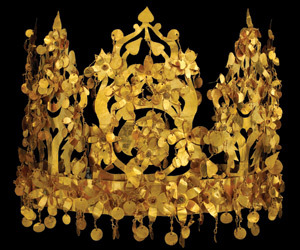 to the 5th century A.D., the headdresses of the Eurasian steppe nobility were traditionally adorned with the image of the tree with birds on its branches. 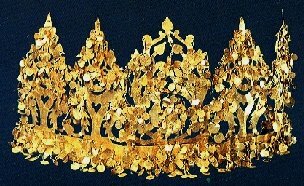 (11) The decorative style of the robe and the crown of a Bactrian woman implied that the bearer of those items was not only a noble, but belonged to the ruling clan, that she was a queen and represented the Goddesses of Fertility. All her regalia were symbolized by the Tree of Life on the crown. The above-mentioned objects were found in the sixth tomb of Tillya-tepe. The motif of the Tree of Life surrounded with animals was particularly popular in the first millennium B.C. In this period Iranian – speaking tribes were settling down, and the evolving pictorial art of the Scythes was influenced by North-Iranian art. In Chinese philosophy, which influenced Central Asian beliefs, the tree is one of the five elements of life: the tree, the fire, the earth, the metal and the water. They evolved from chaos in the process of interaction between two poles, Yin and Yang. These are the essential categories of natural philosophy signifying the unity of polar forces, the forces of the soft and the hard, the female and the male, the light and the dark, etc. (10) In Korean mythology the image of the tree, for instance, embodied the magic contract between Man and the other world. Symbolic properties were attributed not only to metals (the Sun was associated with gold and the Moon with silver) but also to the precious stones used in jewelry. In the history of culture, stones had particular significance as durable substances resisting destruction. The worship of stones was connected with the belief in their healing properties. Stones were endowed with magic healing power, which evoked when they were touched or worn as amulets or ground and swallowed as a medication. To reinforce the magic powers of the semiprecious stones, jewelers increased their dimensions on the ornaments and multiplied their number. Among the stones popular with the jewellers of the period under study were turquoise, garnet, lapis lazuli, pearls, cornelian and coral. Turquoise symbolized purity and virginity, it indicated dignity and wealth. It was supposed to safeguard travelers on their way and reconcile spouses; it was believed to improve eyesight and to help in communication (1). The notion of magic powers of the stones intermingles with the rational approach to their utilization in folk medicine. The peoples of Central Asia used pearls and corals to treat lung diseases. When powdered, they were used to stop bleeding and as astringents. Corals were considered to bring prosperity and fertility (2). This special attachment to corals and pearls may stem from astral cults. Pearl application in earring and necklaces evoked the sparkle of the Moon and were allegedly bringing wealth to those wearing the ornaments. Carnelian was associated with Mercury and Venus, the planets named after patrons of trade: the God of Wisdom and the Goddess of Beauty and Fertility. There are two different types of carnelian, which are distinguished as male and female stones. Male carnelian is of a crude brown color, while female is pinkish orange transparent. This stone was believed to protect eyesight, safeguard home and bring happiness and prosperity. The shape of each jewel and ideas underlying it reveal the two basic reasons for wearing it - reason that, in their turn, determine the meaning codified in a particular item. The first reason, aesthetical, is based on the intention to emphasize female beauty in accordance with local ideals and to stress the male power and masculinity. The second reason, ritual, reflects ideological concepts handed down by the previous generations expressed in the belief in the protective powers of the ornaments used as talismans. When performing religious rites, fine arts were essential in order to record the secret meaning of the ceremony in visual form. Characters depicted in jewelry, as well as their attributes and gestures, did not have any actual narrative meaning. Rather, they were signs to be deciphered and translated into the language of concepts. Goblet D. Alriela (1972) The migration of symbols, N.Y.